BOSTON, Mass. — BioBright, a firm developing technologies to enable more precise, more reproducible research protocols in biology, has improved the accuracy of a delicate laboratory technique by more than 20 times in the first deployment of its tools in a working laboratory. BioBright’s assistive technologies also allowed a single scientist to do the work normally required by two. Key to the achievements: a voice-recognition system that, among other things, allows scientists to verbally document steps or surprises in an experiment, and software that automatically collects all the data generated by an experiment, including transcriptions of the scientist’s verbal comments. The software also makes the data generated by laboratory equipment easily accessible. “BioBright’s tools give scientists the ‘superpowers’ associated with operating in the digital world,” says Charles Fracchia, BioBright CEO. Today a scientist conducting an experiment must generate the data and collect it at the same time. That’s difficult because generating the data in and of itself requires both hands and many complex movements. Collecting the data interrupts that process because the scientist must stop to record it by hand in a notebook. Due to this problem and other factors, “a great deal of data is not being captured,” says Fracchia. That additional information could help scientists understand better what does and doesn’t work in an experiment. It could also help other scientists reproduce the work. According to a survey in Nature, 70% of peer-reviewed papers are not reproducible. Nature also reported that incurred costs of irreproducibility in biological research are about 28 billion dollars per year in the U.S. alone. The BioBright voice-recognition system, known as Darwin, and its “hotfolder” software that collects laboratory data were deployed in the laboratory of Professor Bijan Pesaran, a neuroscientist at New York University. Says Pesaran, “BioBright tackled one of the central tasks in my lab—how we move electrodes to record brain activity in implantable systems. Due to the complexity of the experiment, we used to have two people working together. The BioBright system augments a single researcher to do the work of two with more than 20 times greater accuracy in positioning the electrodes." This research was, in part, funded by DARPA’s Biological Technologies Office (contract number HR0011-16-9-0004). The views and conclusions contained in this document are those of the authors and should not be interpreted as representing the official policies, either expressed or implied, of the U.S. Government. BioBright is a privately owned bio-IT company based in Boston, MA dedicated to creating the smart laboratory of the future. The company’s systems enable scientists to better collect and analyze crucial data from experiments. It began operations in 2015. Some biological equipment produces terabytes of data every day in proprietary file formats. 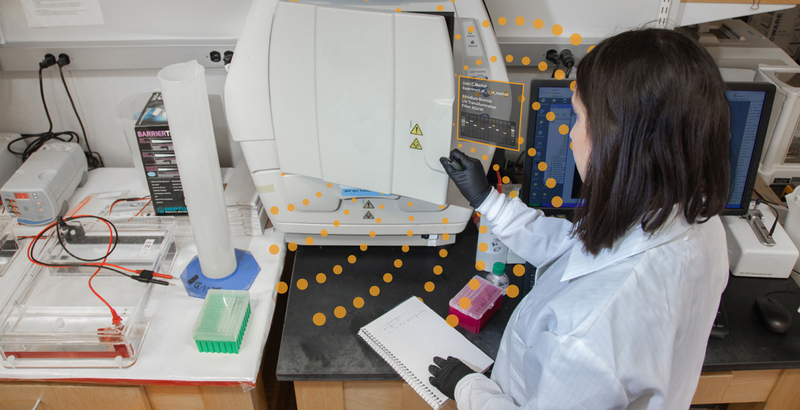 No matter the file type or size, BioBright's hot folder system syncs the data to the cloud for data storage, analysis, and exploration. A scientist who is working in a sterile environment or using both hands needs something better than a paper notebook or keyboard. The "Darwin" voice assistant is customized to the vocabulary of each lab and experiment, allowing users to easily take notes or navigate an application. In a BioBright-enabled smart lab, it's easier to know what worked in an experiment, what didn't, and why. Through integration with existing systems and automatic data collection, more information is available about equipment utilization and environmental conditions.